Have your bee removal done professionally, safely, and completely with our help! Some things are easy to remove from your home. The garbage, outdated magazines, and used tissues definitely fall under this category. Other things, however, are not easy to remove from your home. These things can include your in-laws, dog hair, and bees! While we can’t help you with your pooch or your nosy relatives, here at Florida Bee Removal we want to be your go-to bee removal specialists in Palm Beach, Florida. 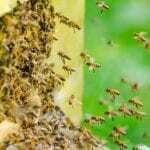 Bee removal is often a tricky, delicate, and intense process that is always best carried out by professionals. Because bees can pose a health hazard to people, protective gear is required. 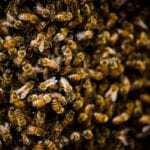 Even if you think you’re not allergic to bees and therefore don’t need protective gear, the truth is that the allergy to bees can develop into adulthood. This means that bee removal by amateurs without the knowledge or protective gear required can be literally life-threatening! Here at Florida Bee Removal we remove all kinds of bees, including bumblebees, carpenter bees, yellow jackets, wasps, hornets, and more. We can help you extricate these insects from the darkest recesses of your home (which is almost always where they like to make their hives!) and relocate them when possible. Once we have finished our bee removal process, we will ensure that no traces of the hive, swarm, or bees are left behind. This will help ensure that your home does not attract future swarms that can smell the slight chemical traces of the removed hive. If you have bees on your property, we want to help. 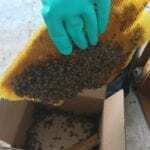 Give us a call here at Florida Bee Removal for our professional bee removal service.